Served Monday thru Friday from 11am-3pm. except holidays. 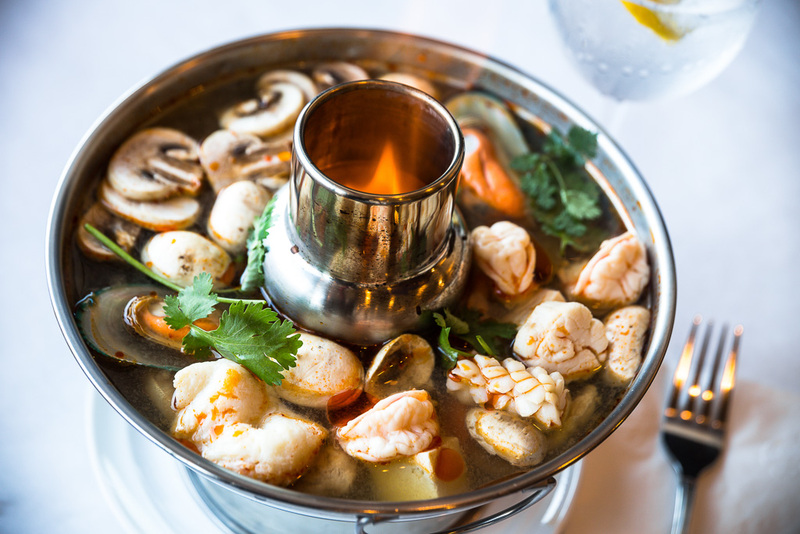 (Soup excluded for take-out order). 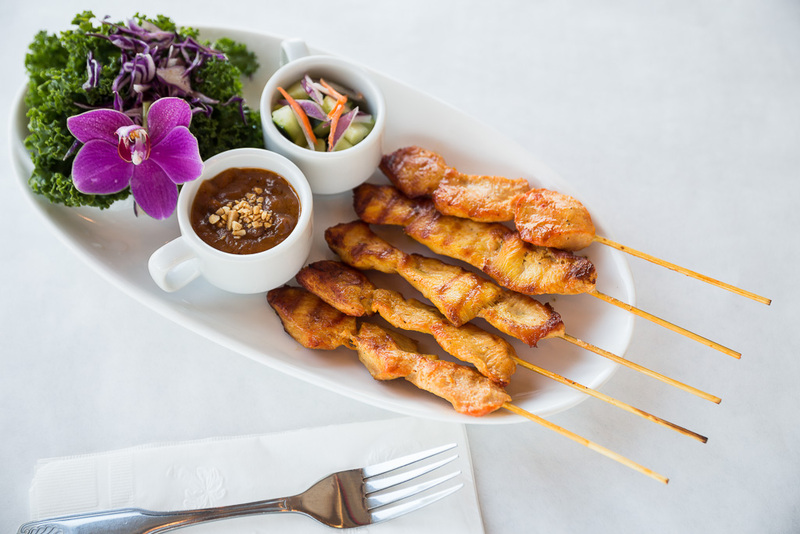 ¼ Grilled marinated chicken with Thai herbs. 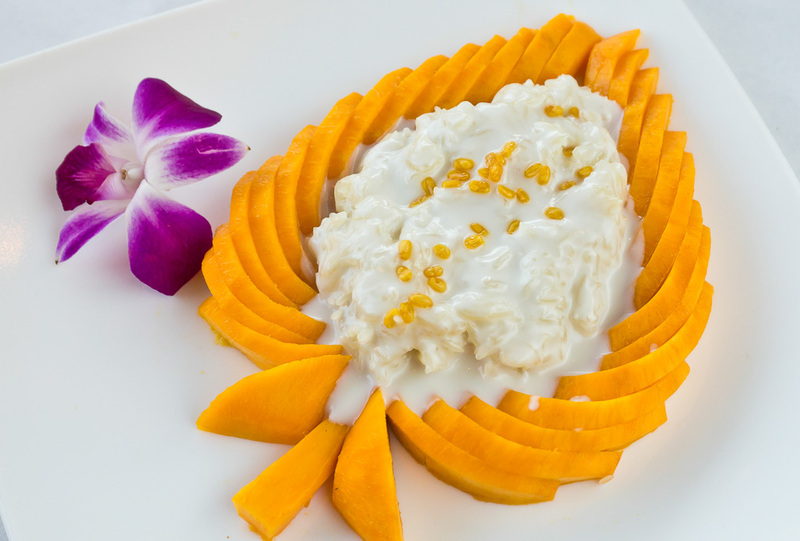 Served with Thai sweet sauce. 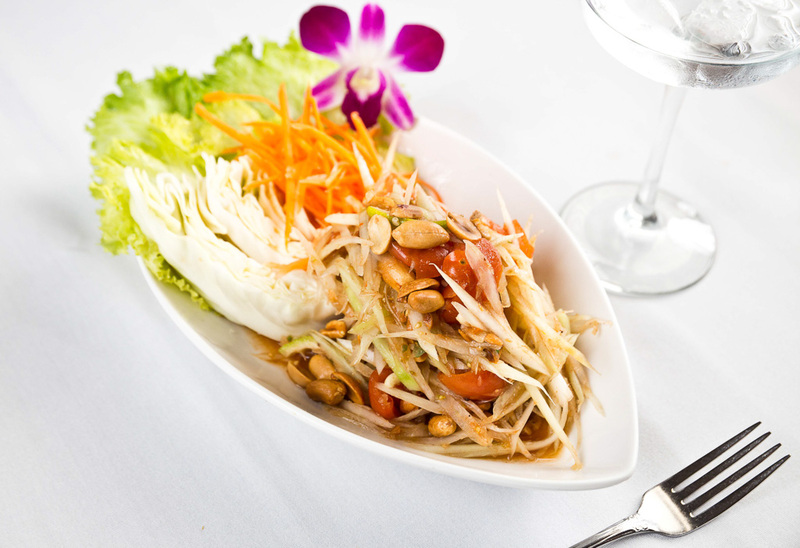 Sautéed with baby corn, straw mushrooms, sliced bamboo shoots & onions. Garnished with cilantro. 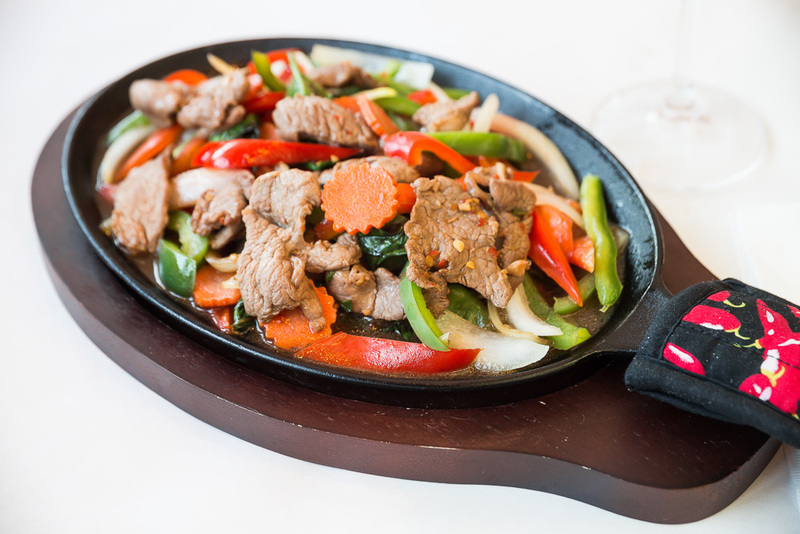 Sautéed with shredded ginger, onions, wood-ear mushroom & bell peppers. Sautéed with onions & bell peppers. Sautéed with bamboo shoots & red chili paste. Sautéed with green beans, kaffir lime leaves & red chili paste. Sautéed with bamboo shoots & bell peppers. Simmered in red curry paste with coconut milk, sliced bamboo shoots & sweet basils. Simmered in green curry paste with coconut milk, shredded bamboo shoots, sweet peas & sweet basils. Simmered in mild yellow curry with coconut milk and potatoes & onions. Simmered in mussaman curry paste with coconut milk, potatoes, onions & peanuts. 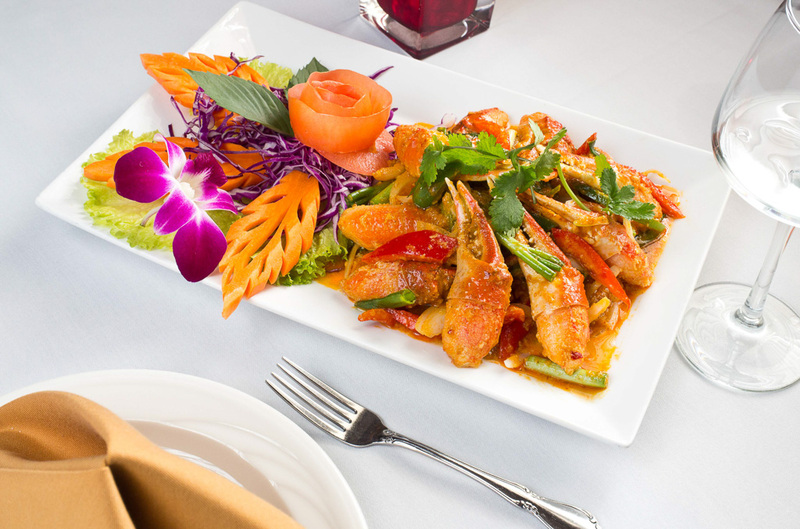 Simmered in rich red panang curry paste with coconut milk, kaffir lime leaves, bell peppers & sweet basils. 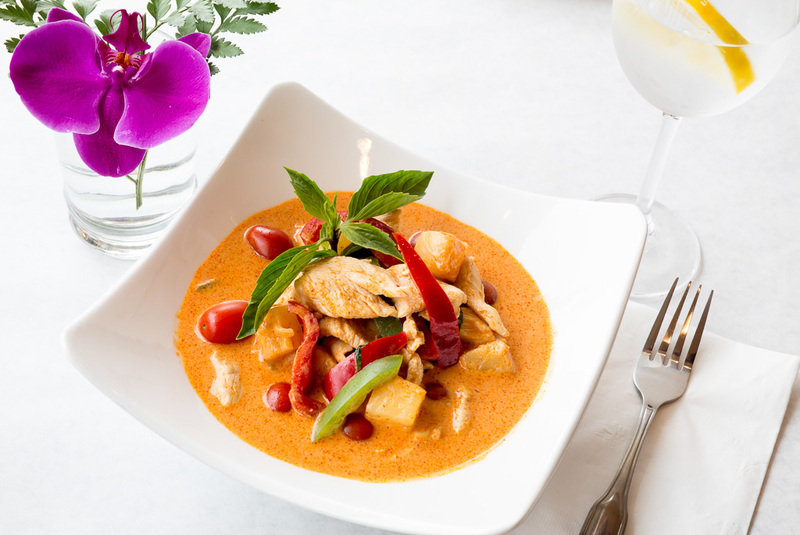 Simmered in rich panang curry paste with coconut milk, Basa fillet, kaffir lime leaves, bell peppers & sweet basils. Half of deep fried pompano fish topped with mushrooms, onions & garlic spicy sauce. Fried tofu sautéed in minced garlic & fresh chili. Fried tofu and eggplants sautéed in green curry, coconut milk, bell peppers & sweet basils. Fried tofu and fresh mushrooms sautéed in red coconut milk, bell peppers, sweet basils &kaffir lime leaves. Sautéed assorted vegetables; baby corn, baby bok choys, bean sprouts, carrots, snow peas, napa cabbage, straw mushrooms & black mushrooms. Eggplants sautéed with minced garlic, fresh chili, sweet basils & bell peppers. Sautéed with Chinese broccoli & oyster sauce. Sautéed with Chinese Broccoli, green onions & dried chili. 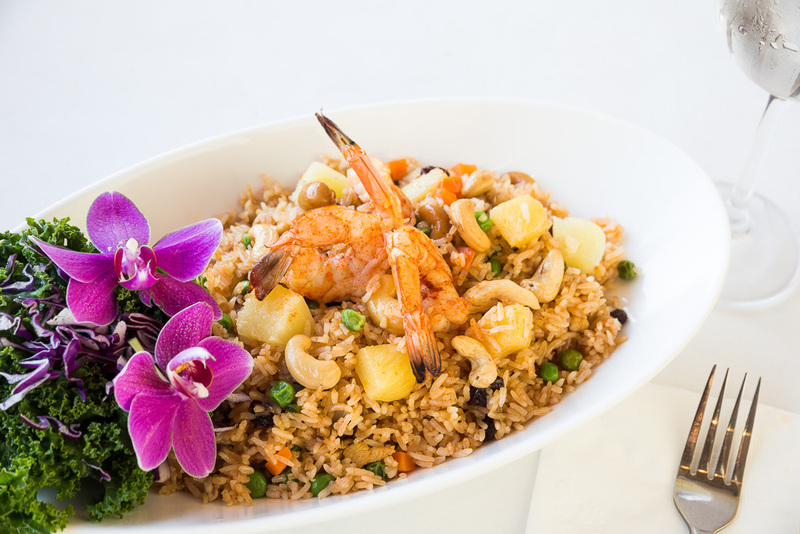 Our most favorite entrée! 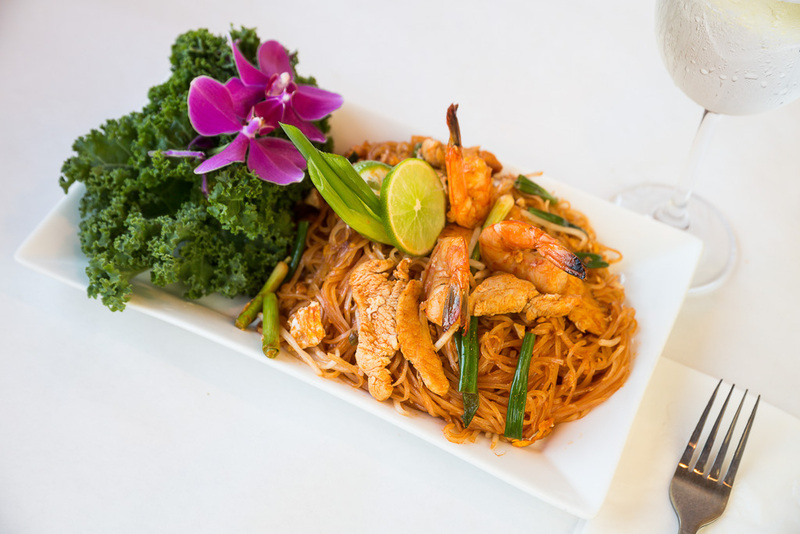 Sautéed with minced garlic, bell peppers, fresh chili & sweet basil leaves. Sautéed with shredded gingers, onions, wood-ear mushrooms & bell peppers. Sautéed with green beans & red chili paste. Sautéed with cashew nuts, dried chili & onions. Stirred fried cellophane noodles with eggs, onions & wood-ear mushrooms. Sautéed with eggplants, fresh chili, minced garlic, bell peppers & sweet basils. Sautéed eggplants, egg, bell peppers, sweet basils & soybean sauce. Sautéed pineapple, cucumber, onion, cherry tomatoes & bell peppers in sweet & sour sauce. Sautéed vegetables; baby corn, baby bok choy, bean sprouts, carrots, snow peas, napa cabbage, straw mushrooms & black mushrooms. Sautéed Chinese broccoli & oyster sauce. Sautéed with Chinese broccoli & dried chili. Crispy deep fried choice of meat sautéed with minced garlic & pepper. (only available with chicken, beef, or pork). Simmered in red curry paste with coconut milk, sliced bamboo shoots, bell peppers & sweet basils. 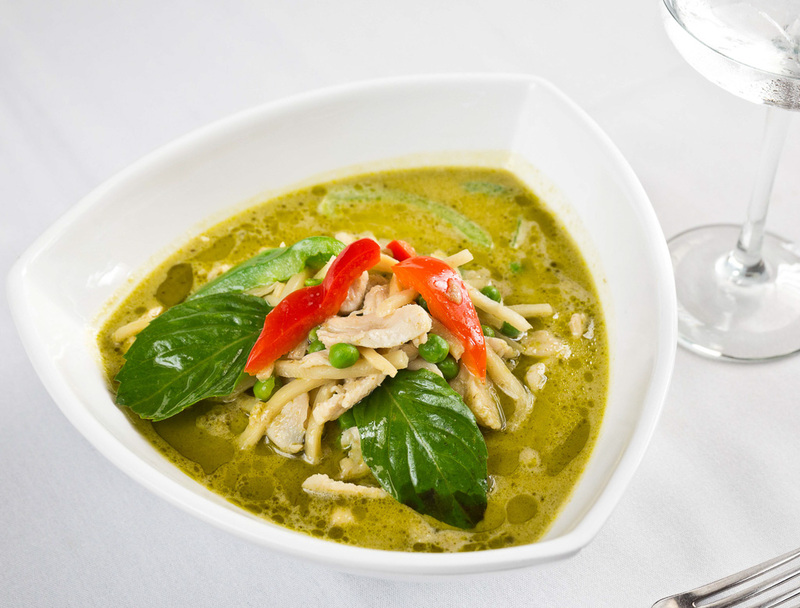 Simmered in green curry paste with coconut milk, shredded bamboo shoots, bell peppers, sweet peas & sweet basils. Simmered in mussamun curry with coconut milk, potatoes, onions & peanuts. This curry has no coconut milk: Simmered in red chili paste with Thai eggplants, green beans, sliced bamboo shoots, carrots, sliced mushrooms, baby corn, bell peppers & sweet basils. We’re closing from Jan. 4th-6th, 2016. And will be open on normal business hours on Jan. 7th, 2016.